Unlike virtually any other supplement on the market today, we show exactly what’s in RAPIDCUTS SHREDDED right on the label; every ingredient and blend is completely spelled out with standardized and patented ingredients. Are you just guessing to determine how much of what you’re getting with other products? Many products on the market today hype ‘liquid technology’. Bottom line, almost 50% of the content in these capsules is ‘INACTIVE’ oil. We believe in providing ‘ACTIVE’ ingredients, not ‘OIL’! That is why every capsule of RAPIDCUTS contains 99% active ingredients, NOT FILLER, NOT INACTIVE OIL! Patented Svetol® Green Coffee Extract and G6P Green Coffee Bean Extract have been concentrated to contain the highest amounts of Chlorogenic Acid; newly released research has shown profound fat-loss effects. Combined with the completely novel and rare Cranesbill Extract at a 200:1 ratio with Hordeum Vulgare RAPIDCUTS® SHREDDED provides a synergistic effect that you must feel to believe. Cardio will never be the same. 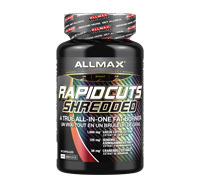 RAPIDCUTS SHREDDED is now fortified with patented Capsimax® – micro-encapsulated nor and di-hyrdro capsaicin, a very potent concentrated form of active capsicum that has a protective layer to sheild your stomach. Capsimax® releases past your stomach to avoid any discomfort and provide maximum benefit – which is; a dramatic increase caloric expediture, amplified thermogenesis and prevention of adipocyte maturation!